Answer: On the top you will note there is a link named "Log In". Here is where you will login. Question: I have forgotten my password, can you help me? Check your login details. Your login username is the email address you used for registration. It might be a problem caused by ATCau.com system maintenance - Please wait 10 minutes and try again. Ensure that cookies from www.atcau.com are accepted in your browser (Internet Explorer or others). If nothing works please submit a ticket, our customer service will help you solve it out. How much for minimum order? Do I need pay GST? If your delivery address is within Australia or if you are purchasing from overseas and sending the item to someone within Australia, 10% GST Tax will be added to your order. Oversea delivery address do not charge GST (Tax Free). On our website all prices are showing not taxed. Our sunglasses lens comply with Australian Standard (AS/NZS 1067:2003). For Australia customer we sent goods from our Australia warehouse and GST will be added on your order. However - In most countries in the world you have to pay taxes on imported goods. Sometimes goods under a certain value, or in certain categories, do not incur taxes. The rules are different in every country. In any one country the rules are often applied differently in different places, and sometimes rather randomly. Unfortunately there is no way for us to know the rules, standard, regulations, customs, traditions, practices, loopholes, schemes, systems, paperwork, codes, laws, or rulings of any country. As such we cannot, and will not, offer advice about taxes in your country. As the buyer, it is your responsibility to find out that information before you order. If you have to pay import taxes and / or additional duties and sales taxes (e.g. VAT in the UK) then you would have to pay that to the courier upon receipt of the package(s). Unfortunately we can't calculate this for you and there is no way to pre-pay it. If you are drop-shipping or sending a gift item to someone else please make sure they are aware of the possibility of having to pay taxes when receiving the goods. Question: I can't Sign in my account. It might be a problem caused by atcau.com system maintenance - Please wait 10 minutes and try again. Ensure that cookies from www.atcau.com are accepted in your browser (Internet Explorer or others). Question:How do I make a warranty claim for items which are faulty or damaged? Answer:We are always sorry to learn of any product problems, but are here to help. The first step is to determine if your product is damaged or faulty. Most items are dispatched within 2 working days of your payment being received. Once items are dispatched, regular Australia Post, Fastway or Direct Express delivery times apply - however, you will be able to trace your delivery online during the entire shipment. 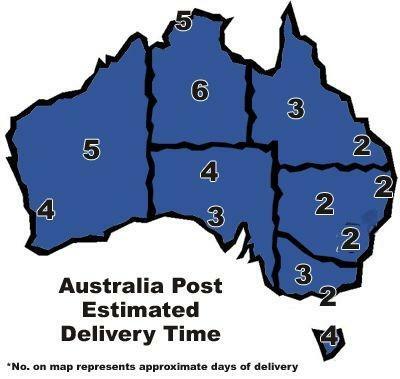 The items are sent from Brisbane and we have included a map below to illustrate how many days in total it should take to receive your item once we have dispatched your item.